FLASH-100 Gang Programmer | FALCON DENSHI K.K. FLASH-100 Gang Programmer is designed to provide high quality programming platform for new released IC products on the market especially for high density FLASH units. FLASH-100 works with multiple Socket Boards to perform multi-site programming for limited / mass production. Through USB port, 4/8 sets of FLASH-100 can be connected to one PC for either synchronous or asynchronous multi-site programming to maximize production capacity. FLASH-100 extremely high freq. core circuit design significantly cut down programming time of high density memory products. FLASH-100 Programmer has 56 x 8 sets of Precise Universal Pin Driver to provide high speed, low noise, accurate and reliable programming signals for various IC products including high speed low power devices recently released to market. Each site owns individual Pin Driver so sites are totally independent without interfering each other during multi-site programming. 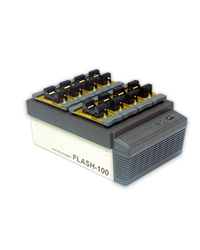 FLASH-100 can be setup for multi-site & multi-set operation when production required. Up to 8 sites x 8 sets = 64 sites can be programmed simultaneously to maximize production. For mass production, the FLASH-100 based Automated Programming System, AT3-300 Series, can serve the requirement. The supporting software is updated weekly on our web site for check / retrieve through Internet easily. Programming of new products will not be neglected after purchasing. ■Excellent performance : FLASH-100 extremely high freq. core circuit design significantly cut down programming time of high density memory products. Precise Universal Pin Drivers provide high speed, low noise, accurate and reliable programming signals for various IC products including high speed low power devices recently released to market. ■Wide range of IC coverage : FLASH-100 supports wide range of IC products including EEPROM, Serial EE, SPI memory, NOR/NAND FLASH, MPU/MCU product types and DIP, SDIP, SOP, SSOP, TSOP, PLCC, QFP, QFN, SON, BGA package types. ■Easy to setup & operate : FLASH-100 setup and operation can be done easily by connecting Programmer to PC with Windows 2000/XP/Server 2003/Vista O.S. through USB port, load data file or read Master IC, then select functional options (Program、Verify、Auto..etc.) to start programming. ■High expansion flexibility : Easy to expand programming types for various FLASHs by simply replacing appropriate Socket Boards on top of Programmer. ■Timely software support : The supporting software is updated weekly on our web site for check / retrieve through Internet easily. Programming of new products will not be neglected after purchasing. ■World wide service : Distribution channel covers 35 countries worldwide, all inquiries / problems can be served easily and timely. Functions Key functions Load File、Read Master、Program、Verify、Auto、ID Check、Checksum、Blank Check、Erase、Secure、Protect / Unprotect、Edit、Function Configuration、Self Test. Support devices IC types EEPROM, Serial EE, SPI memory, NOR/NAND FLASH, MPU/MCU…etc. IC packages DIP, SDIP, SOP, SSOP, TSOP, PLCC, QFP, QFN, SON, BGA…etc. Load / expansion capacity Up to 8 sites parallel programming per set. Up to 8 sites x 8 sets = 64 sites per PC setup. Transfer speed USB1.1 : 12 Mb/sec. Loaner unit is available at freight collect for Japanese domestic customers.